How about swap the 5 & 7? Or swap 3 and 7. White needs to hit higher in order. Is it just me, or doesn't it seem like when White plays 1B, he bats higher, and when he DH's, he bats lower? He should be higher, Correa lower. Also, I'd play Reddick at CF, Marwin at RF, Kemp at LF with this outfield trio. Please tell me Springer is OK.
Kemp excelled at the 9th spot. Not good as a lead off hitter. HTown2017Champs and seemoreroyals like this. And spreading out the left handed at bats. Hope the team is rested up and puts forth a better offensive effort than yesterday. That's a questionable lineup...so, the Astros will score double digits. 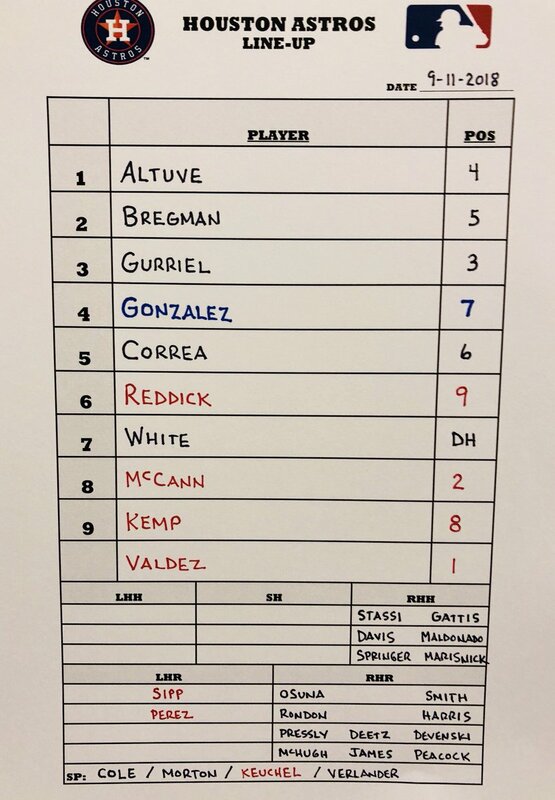 Lineup looks fine to me, with Springer getting the day off. That lineup is very capable of crushing tonight. Marwin has been ballin for over a month. Just missed that HR yesterday too. Springer and Correa's injuries are affecting the lineup. 790 reports Sean Manaea will be out '18 and ALL of '19 after his shoulder surgery. I'm just happy Altuve's in there and playing in the field today.